A few weeks ago, I was contacted by Paul Foreman from Mind Map Inspiration. Paul shared the concept of Mind Maps with me, and told me how they could be used to divert or distract a toddler’s attention during a tantrum or time of distress, and focus him on relaxing and calming thoughts. I liked the idea and thought it has potential, so I decided to share it with you all here. Mind maps have been around since the 3rd century and have been used throughout history by many great thinkers and philosophers. They are typically used for learning, brainstorming, memory, visual thinking and problem solving. The idea of using mind maps to bring tantrum relief is still in its early days. What is a mind map, you ask? 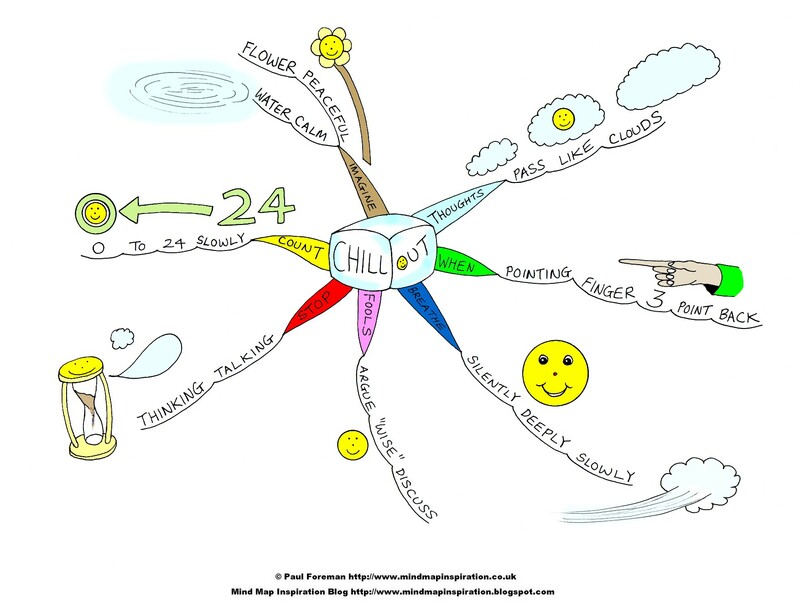 Paul’s mind map is called “Chill Out,” and it is meant to help you and your child do just that. It does this by reminding us of the various ways that we can calm ourselves in times of stress, such as breathing, thinking peaceful thoughts, counting backwards and more. I challenge you all to try it out and let us know if you have success with it. 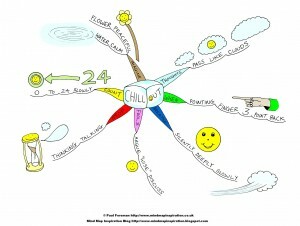 Download and print out the “Chill Out” mind map that I have attached here (courtesy of Paul Foreman). Chill Out Mind Map Download. This Mind Map can also be downloaded here. Laminate it if you wish. Show the Mind Map to your child and describe how she can use it to channel her thoughts towards calming and relaxing notions. To do this, she starts in the centre of the mind map, where the “Chill Out” cube sits. From there, she can branch off along the “Imagine” branch, or the “Count” branch, or any other branch. Each branch provides a different relaxation technique. If she follows the “Imagine” branch, for example, the mind map reminds her, or cues her, to imagine water, and this is calm. Or a flower, which is peaceful. The images of water and flowers provide additional visual cues. Go through this with your toddler a few times so that he understands it and knows how it works. Next time your toddler is upset and needs to “chill out”, bring out the mind map and focus his attention on it. The visual cues and words will remind him (and you) of the various paths to serenity. You can follow different paths or branches each time. One time you can follow the “Breathe” path, remembering to breathe silently, deeply and slowly. Another time you can branch off along the “Count” branch, cuing you to count backwards from 24 to 0. Remember that this is a tool that can be used by adults too…meaning, next time you feel stressed or upset, you can use the “Chill Out” mind map to remind yourself of the various paths to calamity. Once you are comfortable with mind maps, start mind mapping with your child by having her create her own. Using her own words, ideas and pictures will make the mind map even more meaningful and effective for her. That’s all there is to it. If you or your child take well to using mind maps, you can try using them for brainstorming, studying and learning as well. Do you like this idea, and would you try it with your child? Let us know! If you do try it, let us know how it goes! Thanks to Paul Foreman for sharing this idea with me and allowing me to provide the “Chill Out” mind map for download at the Dad Jam. It’s such a pleasure to see my ad on your blog today … it looks great here! The mind map is a terrific idea, although I have my doubts as to how attentive my kids would have been when they were toddlers. @Ari, I agree…feel free to advertise here again! Thanks for your comment…you are right, keeping the kids’ attention on this long enough could be a barrier to success, but with enough tries, it might work. I can keep Smarty Pant’s attention long enough to read a couple of short books to him, and a mind map shouldn’t take much longer than that. Not sure though… gotta try it out and see! Thanks for this brilliant article, you have explained Mind Maps extremely well and I hope parents will give it a try – it will make a huge difference to their child’s learning potential. I wish those experimenting with Mind Mapping every success – and look forward to hearing how people get on. @Paul – thanks for your comments and kind words. I look forward to hearing from other parents who give this a try as well.